Which Industries Have High Rates of Substance Abuse? What Kind of Drugs Do They Abuse? Why Do These Workers Turn to Drugs or Alcohol? 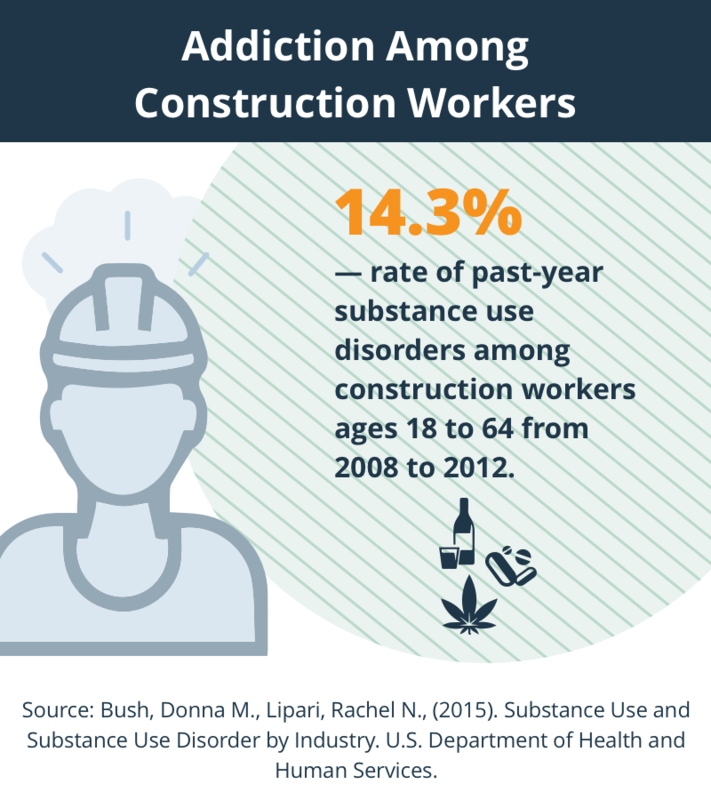 What Are the Effects of Substance Abuse on Blue-Collar Workers and Their Employers? What Are the Signs That Someone May Be Abusing Drugs or Alcohol? What Treatment Options Are Available for These People? What Are Some Ways to Deal With Substance Abuse in These Industries? Some blue-collar jobs have high rates of alcohol and drug abuse. Workers in these types of jobs are at risk of being injured and developing dependence on pain medications. An addiction can lead to accidents, termination, and health problems.Employers have recently become more aware of substance abuse on the job and have developed strategies, such as drug-free workplace policies and employee assistance programs, to prevent drug abuse and get help for those who need it. 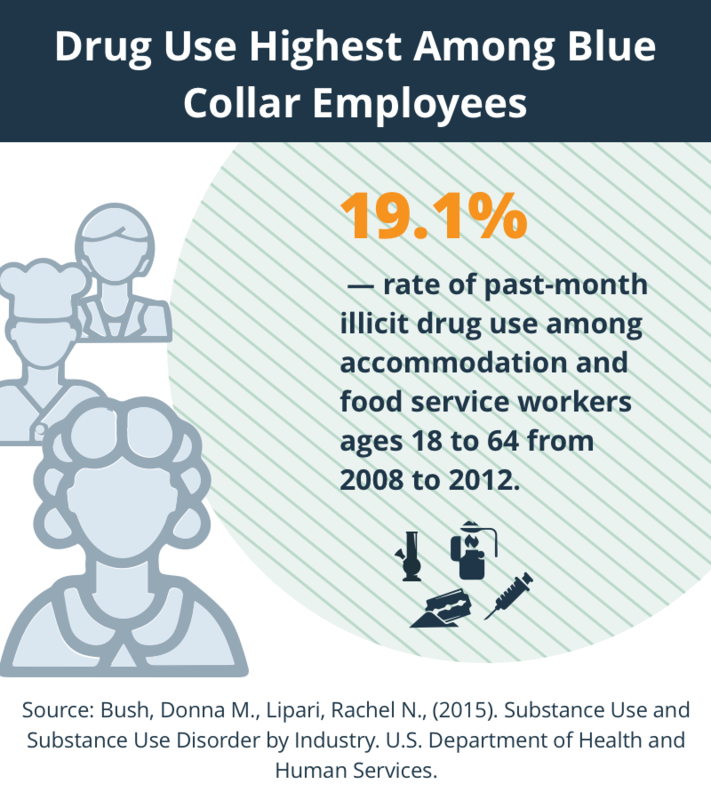 Some industries tend to have higher rates of substance use than others. A report from the Substance Abuse and Mental Health Services Administration (SAMHSA) used survey data to rank industries according to their drug and alcohol use. 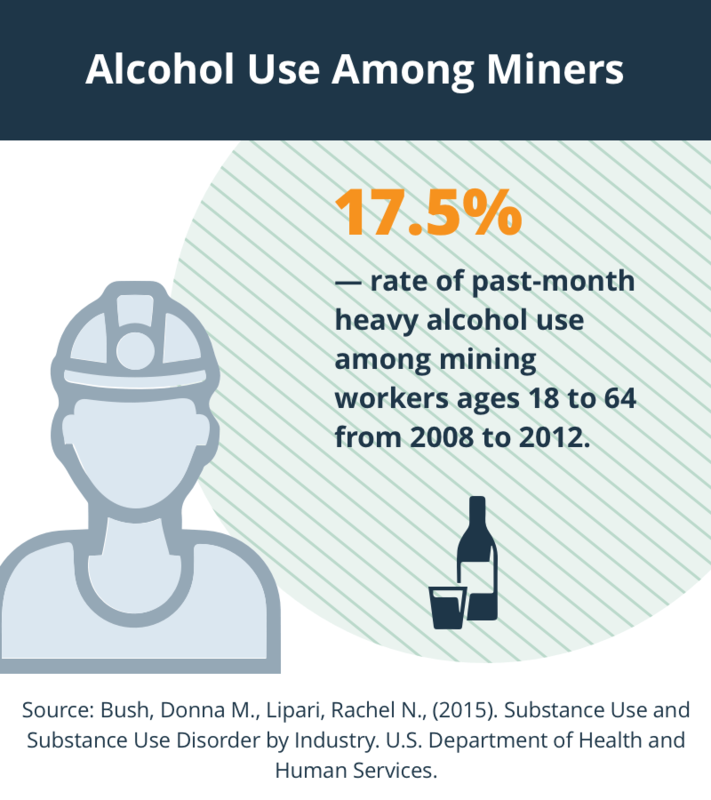 Mining: The mining industry scored the highest on past-month heavy alcohol use among full-time workers, at 17.5%. They scored fourth on past-year substance use disorders, at 11.8%, but this rate was down from 2008 to 2012 compared to 2003 to 2007. Rates of heavy alcohol use increased from 2008 to 2012 compared to 2003 to 2007. Construction: Construction workers came in second behind miners in heavy alcohol use, with 16.5% of those surveyed using in the past month. They also scored second on past-year substance use disorders, at 14.3%, but this rate was down from 2008 to 2012 compared to 2003 to 2007. Rates of heavy alcohol use increased from 2008 to 2012 compared to 2003 to 2007. Food services industry: The highest rate of past-month illicit drug use was found in the accommodations and food services industry. This industry also scored the highest for past-year substance use disorders, at 16.9%, but the rate from 2008 to 2012 was down compared to 2003 to 2007. Rates of illicit drug use in this industry were higher from 2008 to 2012 compared to 2003 to 2007. 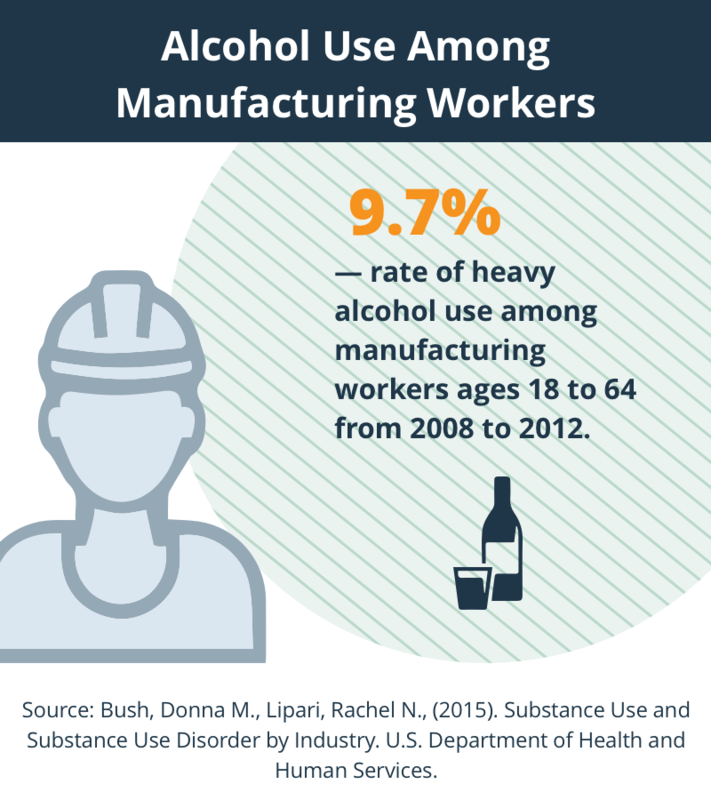 Manufacturing: Manufacturing had high rates of heavy alcohol use (9.7%), illicit drug use (7.4%), and past-year substance use disorder (9.3%). Alcohol: People may use alcohol to socialize or blow off steam. Some workers may gather after work at a local bar, while serving alcohol may be part of the job for other workers, such as bartenders and waitresses. Easy access and regular use can increase the risk of abuse and alcoholism. Opioids: Opioids include several legally prescribed painkillers and illicit drugs with rewarding, euphoric effects. Common opioid medications include oxycodone, hydrocodone, and morphine.3 Heroin is a highly addictive illegal opioid. 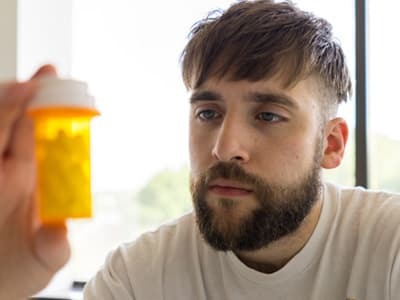 Workers may be prescribed opioids after an injury and later develop dependence, either by taking more than prescribed or by taking them for longer periods than prescribed. Methamphetamine: Methamphetamine increases attention and wakefulness and decreases appetite.5 Workers who must be alert for long hours, such as truck drivers, may use methamphetamines to help them stay awake, especially if they are driving overnight. Tobacco: Tobacco products can be smoked, chewed, or sniffed and contain nicotine, which is addictive.6 Many workers may use tobacco to relax, but end up becoming addicted. Cocaine: Cocaine is a highly addictive stimulant that provides a sense of euphoria or extreme happiness.8 Like methamphetamine, workers may use cocaine to give them a boost on the job or as a recreational drug for partying outside of work. Jeff Trapp, a coal miner for 30 years in Virginia, needed surgeries to fix seven ruptured and herniated discs. The doctors recommended a magnesium rod implant to stabilize his spine, but he opted for painkillers instead. When they didn’t work anymore, he began to drive to Richmond and Roanoke from his hometown near the Kentucky border to find doctors who would prescribe him more pills. Eventually, he turned to dealers and began crushing the tablets and snorting them. He spent $60,000 on painkillers in two years. Finally, his wife took him to a clinic to get help in 2005, and he was started on methadone. “This methadone makes you feel like a human being again,” he says. Injuries: Many blue-collar jobs are physical, which increases the risk of injuries on the job. In 2015, 2.9 million Americans suffered from workplace injuries or illness. Of these injuries, 700,000 occurred in goods-producing industries such as mining, agriculture, construction, and manufacturing.9 Injuries can lead to prescriptions for potentially addictive drugs such as painkillers. Workers may come to rely on the drugs for pain relief and develop a physical dependence, which can turn into an addiction. Stress from the job: Stress from working long hours, being in dangerous conditions, or serving difficult customers can create a desire to escape or relieve the pressure. Sometimes, this escape is found in the use and abuse of drugs or alcohol. Socializing after work: Alcohol use after work with co-workers can progress to overuse, addiction, or use of other drugs, both legal and illegal. Staying awake during the night: Some workers, like truck drivers, use drugs such as amphetamines or other stimulants to stay awake. Be more alert and more productive: Taking stimulants may be viewed as a way to increase productivity and focus. However, the eventual “crash” when the drug wears off can prompt repeated and likely increased use-a practice that can quickly lead to addiction. Dealing with fast-paced work: Workers may use stimulants to keep up with a high volume of work or deal with customers. Job loss: Job loss or periods of unemployment—which can be common in industries such as construction—can lead to depression and low self-worth. Unemployment also affects home life and increases the risk of martial and financial problems. These effects can drive someone to drink or use drugs. Ease of access: Working in a bar or restaurant with alcohol increases temptation and leads to frequent substance use. Many employees in the food service industry also go out for drinks or party after shifts. This habit may lead to a pattern of increased use and abuse. Witnessing and being threatened by death: Miners are at risk of being killed from roof collapses or seeing someone killed or seriously injured. These kinds of traumatic events can lead to substance abuse to deal with uncomfortable feelings related to the events. Below are some of the effects of an addiction on a worker and their company. Lost productivity: An inability to keep up with projects, physical demands, or daily production is common among regular drug and alcohol users. Drugs can affect the ability to focus as well as make people feel fatigued. Accidents: Alcohol and other drugs may cause a person to feel like they can do anything, while impairing coordination. This lack of coordination, along with poor judgment, can lead to a workplace accident. Increased worker’s compensation claims: Drug or alcohol use at work can lead to accidents that leave the user hurt on the job, which in turn can lead to a worker’s compensation claim. Job turnover: If the user has issues with absenteeism, tardiness, or poor performance, it may lead to discipline or even termination. Sean Benschop, an equipment operator, unsafely used an 18-ton excavator on a building demolition project in Philadelphia on June 5, 2013. A wall gave way and fell on a nearby store, killing 6 people and injuring an additional 13. After the accident, Sean tested positive for marijuana and codeine. Due to his previous record, Sean was sentenced to 7-15 years in prison, while the construction contractor was sentenced to 15-30 years in prison. The building inspector committed suicide a week after the accident. Although drug abuse affects every person differently, you can look for common signs and symptoms. The user may act differently than they used to, may miss more days or show up late, or have a hard time completing work. Isolation: A co-worker who once chatted with others on breaks or at lunch no longer talks with others and isolates themselves during the work day. Lack of interest in physical appearance: The user may appear unshaven or tired. They may not pay as much attention to the clothes they wear and not shower. They may have bloodshot eyes or smell like marijuana smoke or alcohol. Mood changes: People who are addicted to drugs will often have mood changes. Mood swings may be significant and frequent. They may be chatty and talkative, then become quiet and withdrawn. Absences or tardiness: Workers who are abusing drugs and alcohol may begin frequently coming in late, calling in sick, or taking long lunch breaks. Problems at work: A coworker who suddenly has issues with poor work performance, lack of productivity, or disciplinary problems may have a drug abuse issue. They may get into arguments with co-workers or fail to meet deadlines for projects. The overall quality of their work may decline. Theft. Items from the office may go missing. The worker may also begin to borrow money from other co-workers. Drug abuse must be treated in order for the user to fully recover. Treatment is dependent on how long the use occurred, how severe it was, whether the person has any mental health or medical problems, and what type of substance was used. Treatment is offered in several different settings. Inpatient: Inpatient centers require the user stay overnight to receive both medical and supportive treatment while they go through detox. These programs are best suited for users who have significantly severe addictions and/or medical or mental health conditions in addition to the addiction. Inpatient treatment centers will either have group or individual counseling available after detox, as well as 12-step meetings. Treatment usually lasts 30-90 days. Outpatient: Outpatient programs work well for users who have no other medical conditions and have a safe, supportive home environment. These treatment centers will require the user to come to counseling and other sessions at regular intervals to ensure that the treatment is appropriate and that the user is following the prescribed treatment plan. 12-step: These programs combine group therapy sessions and community by bringing users together to support one another. They require abstinence from all members and encourage them to work with a sponsor to complete the steps to recovery. Common 12-step programs include Alcoholics Anonymous (AA) and Narcotics Anonymous (NA). SMART Recovery and Secular Organizations for Sobriety are non-spiritual step programs. Telemedicine: Telemedicine offers two-way real time communication between the person in the program and a physician or other medical professional using audio and/or video equipment.18 Health clinics are being encouraged to expand telemedicine programs to increase access to services for people who live in rural areas. Though telemedicine lacks the hands-on element of in-person treatment, it is an invaluable resource for those without access to rehabilitation programs or who might not seek help otherwise. Aftercare programs: Addiction is a long-term health issue that may require life-long maintenance after treatment. Many rehab centers refer users to aftercare programs such as group counseling, individual therapy, 12-step programs, and sober living. Having accountability to others helps people with substance abuse problems stay on the path of recovery. Many insurance plans will cover substance abuse treatment. However, check with your carrier before beginning rehab. If your insurance does not cover the treatment you need, you can ask the facility about sliding-scale programs based on income, payment plans, or financing options. Implementing EAPs: Employers may decide to implement an employee assistance program to provide added support to their employees during difficult life experiences as well as with issues of drug use and abuse. Return-to-work agreements: Many workers may be reluctant to come forward about their substance abuse because they fear losing their jobs. Reassuring workers that they will be able to keep their jobs after rehab, through return-to-work agreements, could encourage more people to seek help. 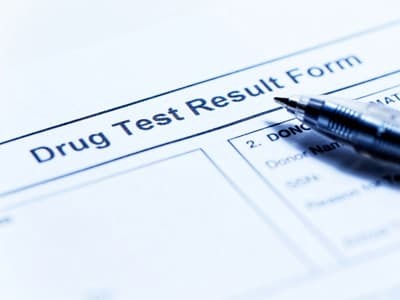 The employee agrees to follow certain rules as a condition of being allowed to return to the company, such as remaining abstinent from drugs or alcohol and being subjected to alcohol and/or drug tests. Restaurant Recovery: This organization helps restaurant workers find help for drug and alcohol problems. Chefs With Issues: This website shares stories and resources for people in the food industry who struggle with depression, anxiety, and addiction. Healthfinder.org: This website is part of the U.S. Health and Human Services Department and offers free education on multiple health issues, including addiction and addiction treatment. National Institute on Alcohol Abuse and Alcoholism: This is part of the National Institutes of Health and offers resources and education to assist with understanding and seeking treatment for alcoholism. The Substance Abuse and Mental Health Services Administration’s Behavioral Health Treatment Services Locator: This tool lets you search for free and low-cost drug and alcohol recovery programs in your community. Alcoholics Anonymous: The organization’s website helps you find AA 12-step meetings in your area. Bush, Donna M., Lipari, Rachel N., (2015). Substance Use and Substance Use Disorder by Industry. U.S. Department of Health and Human Services. National Institute on Alcohol Abuse and Alcoholism. Alcohol’s Effects on the Body. U.S. Food and Drug Administration. (2017). Opioid Medications. U.S Department of Justice. Section V – Valid Prescription Requirements. National Institute on Drug Abuse. (2017). What are the immediate (short-term) effects of methamphetamine abuse? National Institute on Drug Abuse. (2017). What is Tobacco? National Institute on Drug Abuse. (2017). What is Marijuana? National Institute on Drug Abuse. (2016). What is Cocaine? U.S Bureau of Labor Statistics. (2016). Employer-Reported Workplace Injuries and Illnesses-2015. Rico, Laura. (2009). Job loss and mental health. National Institute of Mental Health. Any Mental Illness (AMI) Among U.S. Adults. Office of Personnel Management. Work-Life. Alcoholism in the Workplace: A Handbook for Supervisors. Department of Public Safety. Alcohol, drug abuse and workplace violence. National Institute on Drug Abuse. (2007). Neurobiology of drug addiction. National Institute on Drug Abuse. (2017). Signs of Drug Abuse and Addiction. Office of Personnel Management. Work Life – Employee Assistance Programs. Substance Abuse and Mental Health Services Administration. (2015). CCBHC’s using telehealth and telemedicine. National Institute on Drug Abuse. (2017). Drug Testing. University of Massachusetts. Drug Use Awareness – For Managers/Supervisors: Addressing Employee Substance Abuse. Centers for Disease Control and Prevention. (2017). Opioid Overdose. Wickizer, T., Kopjar, B., Franklin, G., and Joesch, J. (2004). Do Drug-Free Workplace Programs Prevent Occupational Injuries? Evidence from Washington State. Health Services Research, 39(1), 91-110.